The edges of the panel are chamfered to from a frame. 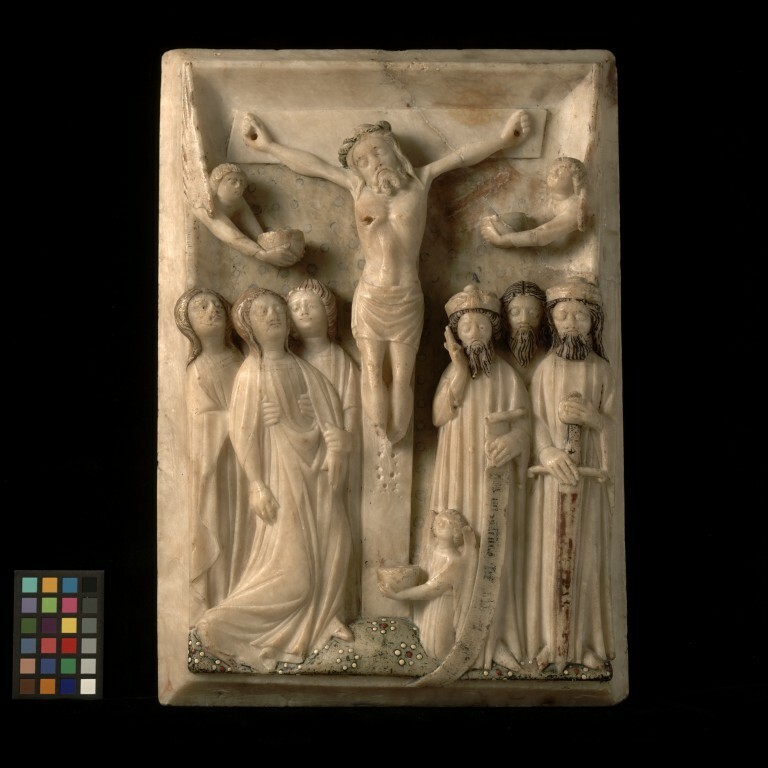 The bearded Christ, wearing the torse, his head inclined to the left, and naked except for the loincloth, is on the cross in the centre of the panel. The wounds in the hands are shown as holes; the nails are not represented. On his right is the wound in his side. Two flying angels hold basins beneath his hands and a third angel kneels on the ground on the right of the cross, holding a basin beneath Christ's feet to catch the precious blood. The Virgin Mary, wearing a gown and a cloak, is on the left of the panel, swooning backwards, supported by one of the Marys (Magdalene or Cleophas). On the Virgin's left is the beardless figure of St. John the Evangelist who holds her left arm with his left hand. On the right of the panel stand three figures. The centurion, with a forked beard and wearing a hat with a turned-up brim and a knop, a long gown and gloves, points up at Christ with his right hand, while in his left he holds a vertical scroll which still bears the inscription 'Ihs nazarenus rex iudeorum filius dei vere' (Jesus of Nazareth, the King of the Jews, truly the Son of God). Next to the centurion stands a similar figure with a spade-shaped beard, who holds a large sword, presumably to show that he is a soldier; the point rests on the ground between his feet. A third figure with a pointed beard stands behind them. 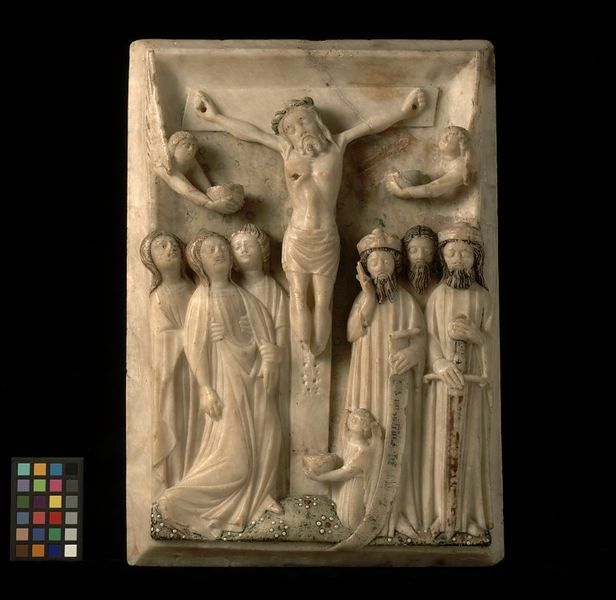 The panel's chamfered edges and the rounded faces of some of the figures indicate a 14th-century date. The lower parts of Christ's legs are missing, and there are holes in the cross which perhaps were dowel holes to hold a restoration. A bad crack across the top right corner has been repaired. Green paint and the usual daisy pattern remain on the ground at the bottom of the panel. Traces of colour remain on the figures, in particular, black on the beards of the three male figures, green on Christ's torse and brown and gilt on the hair of the figures of the two Marys and St. John. The backgound bears traces of gilt and gesso knobs. The inscripton is painted in black. There are six holes drilled into the back of the panel, two of which are filled with lead. A large 'X' is scored across the whole of the back. Formerly in the possession of P. Nelson. Acquired from him by Dr W.L. Hildburgh. On loan from him since 1926. Given by Dr Hildburgh in 1946. 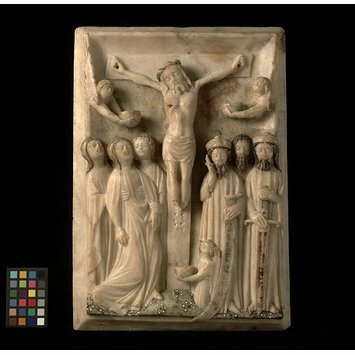 Panel, alabaster, The Crucifixion, England, late 14th century. Nelson, Archaeolog. Journ. LXXVI, 1919, p.84. Burlington Magazine December 1946, p. 292, pl. IIA. Art Bulletin, XXXII, March 1950, p.5, pl. 10. Illustrated London News 19/10/1946, p.446.